Last term, one of the organizing principles of our class was using concept mapping as a metacognitive tool and a way of expanding our adaptive expertise. Indeed, I found it to be a powerful way to process new information and gain insights into my own thinking. Concept mapping allowed me to see and think about ideas and connections I might have otherwise missed. I’ve returned to that practice as a way of exploring this week’s learning. To start, my Padlet links to the Coonley blog post I was assigned and briefly summarizes my thinking that surfaced through the concept map. To view the concept map more easily, click the map in the embedded Padlet to either download a copy or open it in a new window. The rest of this blog post will interpret the map further as a means of exploring my thinking. It will also show a bit of the experience I have with active learning. The first type is the “Cougar Code” lesson summary which arguably contains the most direct information about the lesson. The second is the included media of student work artifacts as well as images of students at work. These constitute information about what students did and possibly trait evidence of active learning and web literacy. Neither type of evidence presents a complete picture of what was taught and what was learned, but together provide insights. What is lacking from each type of evidence also makes complete determinations about the above bullet points difficult to say with certainty. Nevertheless, the evidence that is in the post gives us much to think about and discuss. The summary of the Cougar Code assignment provides the most information that allows some answers regarding the extent to which active learning could occur during the lesson. On the whole, the Cougar Code lesson exhibited many constructivist elements, particularly in its engagement, purposefulness, reflectiveness, and complexity. The assignment is learner-centered from start to finish, beginning with students’ exploration of their own learning styles, the outcomes of which the teacher uses as the launching point for the rest of the lesson. Students seemed to draw from their experiences as well as their values in defining examples of being responsible, being respectful and being safe. I have gone back and forth on the extent to which the lesson elicits metacognition. There are signs of reflection in the Educreations video. But a focus on students’ final products and a lack of formative artifacts makes a definitive determination difficult. For instance, from the attached media, it is difficult to tell the extent to which students actually engaged in active learning or if they were simply completing tasks. When it comes to evidence of web literacy traits, evidence of student outcomes are limited to the 21st Century skills in all three segments of the lesson. It could be argued that the students wrote and participated in that their work became the content of a blog post. However, the blog post analyzed for this assignment was their teacher’s, not the students’. So actually the teacher is demonstrating her web literacy by contributing to building the web and connecting with other educators online. While we definitely want students to be creators and participants online, we want teachers to be as well. Especially in light of research finding that when teachers do use technology, it is mostly for administrative purposes or electronic communication with peers and parents. Even among constructivist teachers — as we clearly see in this lesson — when they do use technology, they tend to do so at levels akin to substitution or augmentation on the SAMR model (Ertmer & Ottenbriet-Leftwich, “Teacher Technology Change: How Knowledge, Confidence, Beliefs, and Culture Intersect”). Thus, from the evidence presented in the blog, technology seems to be primarily the teacher’s tool when it comes to web literacy traits and possibly the students’ tool when it comes to active learning traits. While the Cougar Code lesson suggests quite a few opportunities for active learning in the blog summary, more and better evidence of student formative artifacts would allow for deeper insight and feedback as to the quality of students’ active learning traits demonstrating metacognition. So too would artifacts of the students’ digital photos and their final PicCollage products. More student artifacts would also allow assessment of whether the technology was instrumental in developing students’ understanding of the Cougar Code or whether it was merely a fun activity. I don’t want to dwell on the SAMR level of the work too much given the fact that this lesson was taught at the beginning of the school year. However, going forward, the teacher can consider evaluating this lesson through a SAMR lens. From the evidence presented in the blog post, it seems to ask students merely to substitute and augment traditional learning methods with the available technology. For future lessons, the teacher can consider how similar uses of digital cameras, iPads, PicCollage, and Educreations could be used in such modifying and redefining ways that without the technology, students could not develop a particular level of understanding. She can also consider creating opportunities for students to develop their readerly, writerly, and participatory netizen selves. Inspiring Active Learning by Merrill Harmin & Melanie Toth: A text I’ve used for great active learning ideas. This notion, I must admit, of explicitly stating that students need to be active learners, strikes me as odd. I was taught to be a constructivist teacher, to think in terms of what students do and not just what the teacher does, to focus on critical thinking, collaborative group work, and reflective activities. These traits are how I was “raised” to be a teacher. Given the usual levels of participation, energy and focus I experienced from my students (most of the time! ), I wonder why anyone would think a mostly teacher-centered, student-passive model is preferable. That is, if actual student learning and not just teacher moves is the goal for which we are aiming. Additionally, active learning methods support what we now know about how the brain functions and how humans learn. So yes, I believe teachers should create lessons that give students consistent and regular opportunities to be active learners. 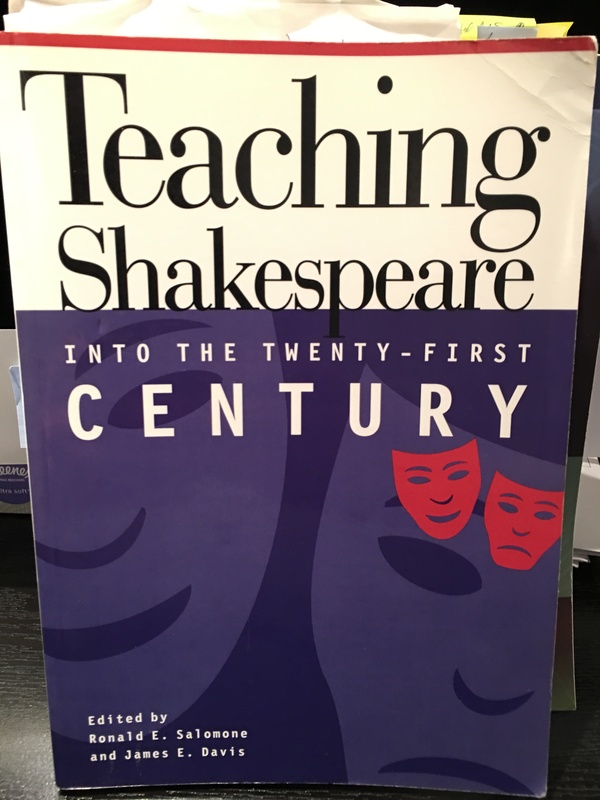 Font of Knowledge and Tempest Prediction & Iterative Terms lessons, based on ideas from Teaching Shakespeare into the Twenty-First Century, Ronald E. Salomone & James E. Davis, eds. the way I introduced Shakespeare from then on. I am showcasing it here because I believe it gives students active learning opportunities. It predates the web as we know it today, so it was not originally written with web literacy in mind. And sadly, I could not find any student artifacts of the completed work to share for evaluation. Still, I have some ideas about how to revise it accordingly and I welcome any ideas from the class.